With plans being made to make the most of the summer months ahead, it’s the perfect opportunity to dust off the camping gear and set off on an adventure in Scotland. What better way is there to unwind than escaping to the most beautiful country in the world* for a night or two under canvas surrounded by breath-taking landscapes, beautiful beaches and wild woodlands? Not sure where to set up camp? In terms of variety, Scotland has it covered from setting up camp on the coast to bedding down for the night in the depths of the forest, campsites from the Scottish Borders to Orkney have their own unique character making any camping trip to Scotland one to remember, meaning everyone’s a happy camper! Scotland has some of the darkest skies in Europe making it the perfect place for stargazing. Head to the Isle of Harris for a stay at the Horgabost Campsite, a remote haven with spectacular views over the water to Taransay Island. It’s a great place to set up a camera and shoot the stars, those lucky enough may even catch a glimpse of the Northern Lights. On the west coast of Scotland light-pollution is practically non-existent making Invercaimbe Caravan and Campsite in Arisaig a stargazers’ paradise. With stunning coastal views, white sands that could be in the Caribbean and waves perfect for surfing, Scotland’s beaches are ideal camping spots. At the far-westerly tip of the Isle of Mull, Fidden Farm Campsite backs right onto the beach meaning campers are in prime position to capture an Instagram-worthy shot or two of the crystal-clear waters and rocky outcrops. 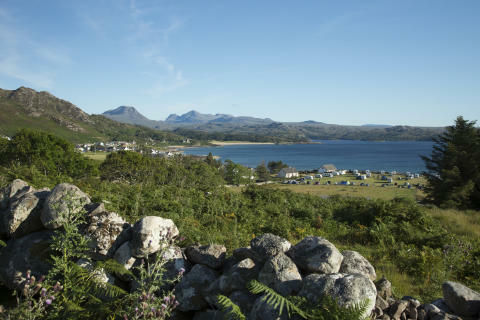 Back on the mainland, Sands Caravan and Camping Park in Gairloch not only offers spectacular views of a golden sand beach but the panoramic vistas from atop the mounds are not to be missed. Head to the recently opened Catchpenny Safari Lodges in Fife for a different camping experience. The canvas lodges are located overlooking the beach in Elie and are completely off grid. Campers wake up with the best views of the sea and can enjoy the simple things from rock pooling and seal spotting to strolling along the Fife Coastal Path. Away from the coast in the woodlands and forests of Scotland, campers can find The Lazy Duck nestled at the heart of the Cairngorms National Park. Camping here isn’t just for summer, this is the perfect place to get lost among the trees – day or night, spring, summer or winter. Winter is particularly picturesque with the snow-capped pines and scrubs. Further south in the rolling green hills of the Scottish Borders, Ruberslaw Wild Woods Camping has a fairytale charm with woodland walks and dense patches of forest. Located in the Teviot Valley’s Special Landscape area, there are plenty of opportunities to explore the campsite’s 500 acres and get close to nature. Lochs, glens and mountains are synonymous with Scotland and the Lomond Woods Holiday Park on the southern tip of Loch Lomond is perfect for this. The combination of mountain slopes and the loch’s gentle waters with the forest and moorland make this an idyllic spot set up camp or stay in one of the site’s lodges. Alternatively, campers can leave the modern world behind and go off grid at Kilvrecht Campsite. Located in the Tay Forest Park and close to the southern shores of Loch Rannoch with the rare conical peak of Schiehallion towering over the waters below, this campsite offers a peaceful pitch where the sound of birds singing is the morning wakeup call. Get up with lark and be ready to witness a stunning sunrise to kickstart the day. On the island of Islay campers at the Port Mòr campsite can watch the sun rise illuminating the ridges on the other side of the water, before it casts a vivid shadow across the gentle waves below. The east-orientated shoreline Ardnamurchan Campsite in Argyll makes it a great spot for taking in the sunrise. Each morning the sun climbs above the distant tips of the northern Highlands with the Sound of Mull below helping the early light beam and illuminate any lingering clouds. At the end of a long day exploring the great outdoors, there is nothing better than sitting back and watching the sunset bring the day of adventure to a close. Wheems Organic Farm in Orkney offers spectacular skyward views which are at their best in early summer, when the island’s greenery is in full bloom. Further south, Tantallon Caravan and Camping Park in East Lothian offers up views spanning across the Firth of Forth and is perfectly placed for capturing a show-stopping sunset. With great views of the Bass Rock and the world’s largest colony of gannets nearby, there are plenty of extra touches that’ll really bring those sunset views to life.